10 years ago the term “professional poker player” was reserved for maybe a couple dozen players at the most, but in the modern Internet era the poker world is full of ‘poker pros’ hailing from all over the globe. Some, like the recently crowned 2013 PCA Champion, Dimitar Danchev, tend to go unnoticed until they break through with a big win; as you’ll see below, the 2013 PCA final table was full of these players. Danchev, a Bulgarian poker player with a short but fairly accomplished resume, was able to outlast the other final table participants on Sunday to take down the PCA Main Event, pocketing over $1.8 million in the process; the largest cash of his career, but not by as much as you’d imagine, bettering the $827k payday from his second-place finish at the 2011 EPT San Remo. 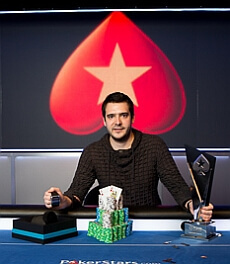 Danchev’s final opponent was Joel Micka, another relatively unknown player who has a fairly strong list of poker accomplishments, including a runner-up finish in an LAPT event in 2008, a win in the 2012 Macau Cup High-Roller tournament in 2012, and a deep run in the 2012 WSOP Main Event where he finished in 269th place. Other players in search of their breakout win included a strong group of up-and-coming Canadians, Owen Crowe (who now has over $2 million in career tournament earnings, including a 15th place finish in the 2008 WSOP Main Event), Jonathan Roy (who won the WPT Montreal just a couple months ago), and Yann Dion (a final table participant at the 2012 Aussie Millions Main Event). Even with the Main Event in the books there is still some unfinished business down in the Bahamas, as the $25k High-Roller event final table will play out on Monday. Leading the way is online legend Shaun Deeb, who will have to deal with the likes of Vanessa Selbst, Ole Schemion, Tobias Reinkemeier, Micah Raskin, Mike Watson, and Bryn Kenny if he hopes to win the $1.5 million first-place prize.